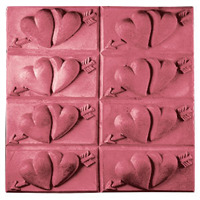 Add some Valentine’s Day love to your surroundings with the Carved Hearts Soap Mold Tray. 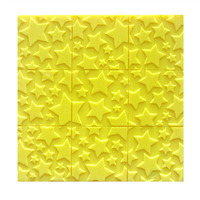 Note there are no score lines on this mold, allowing you to size your soaps to personal preference. 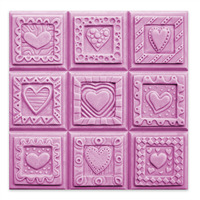 Slab Dimensions: 7" x 6.25" x 1.125"
Bar Depth: 1.125" Bar Length: 7"
COMMENTS: This is a really cute soap mold. I like it because I can cut the bars to suit my needs. 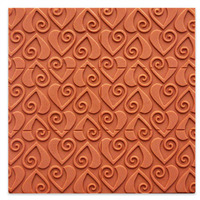 Its perfect for Valentine's Day or anytime of the year. • Would like the mold a little larger. COMMENTS: This mold has a very pretty design, but it is not scored like the other Milky Way tray molds, so it's difficult (for me, anyway) to get equally sized bars from it. "How deep is this mold? " Staff Answer Great question! We will be updating our 'Overview' tab with this information. The dimensions of this mold are: 7" x 6.25" x 1.125"